McMurdo Survival - McMurdo, Ltd. This exciting NEW EPIRB is The State of The Art! The McMurdo SmartFind G8 AIS is the world’s first EPIRB to include 406MHz, 121.5MHz, AIS and GPS/GNSS to accelerate search and rescue. The unique power of this beacon is in the flexibility and additional tracking capabilities long demanded by maritime customers. This will further reduce rescue times by combining the global location power of 406MHz with the localized rescue capacities of AIS. This Category 1 Auto-deployable EPIRB is supplied inside an auto-housing and automatically deployed and activated when in contact with water (although they can also be manually activated). The SmartFind G8 auto-housing incorporates fixing points which ensure previous McMurdo auto-housing units can be retrofitted with minimum impact, when upgrading your vessels EPIRB. 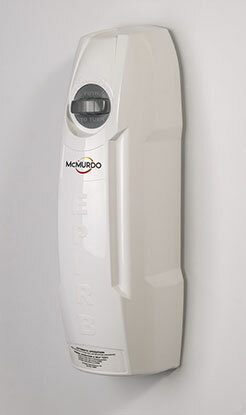 Click the button below to add the McMurdo SmartFind G8 - GPS/GNSS & AIS EPIRB, Category 1 - Auto to your wish list.